This example is a little crude, but hopefully it starts to demonstrate how powerful IFC might be if it was implemented to it's existing capability. Here's a video demonstration which was part of my presentation at the Revit Technology Conference earlier in the year in Melbourne. Sorry for the audio quality. 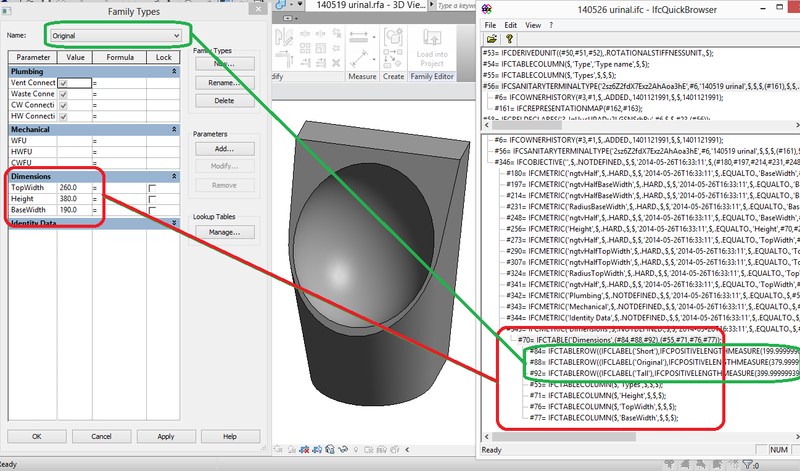 It demonstrates round tripping a revit family through IFC, preserving types and dimensional constraints. At this point in time I've only implemented specific attributes for this prototype, but certainly I am keen to advance this much further if the demand is there. The potential is huge. Revit content could be converted intelligently into content for ArchiCAD, Digital Project, AECOSIM etc etc and vice versa. Content could potentially be downgraded for specific versions of software. If you've suggestions or feedback, I look forward to hearing it. You can download the Revit plugin from http://www.geometrygym.com/downloads Here's the Revit Family and resulting IFC file.